Just Romantic Suspense: Facing Your Fears… Sort Of! Facing Your Fears… Sort Of! Congratulations to "Jonetta A." the winner in Michelle's giveaway. Thank you to all who participated! One of the most common pieces of writing advice that every writer hears, at least once in their journey, is to “write what you know.” Whether or not you subscribe to that adage, there’s one thing that we all know—and probably better than we want to: Fear. We all know what it’s like to feel afraid, to feel that surge of adrenaline in your chest that starts your pulse racing and your heart pounding. It’s a lot like falling in love, really. Maybe that’s why suspense and romance go together so well! Spiders and snakes are common fears for some people—as are public speaking and heights—but you know what strikes terror into my heart? Boats. And the ocean. Boats on the ocean! All right, before you start laughing, hear me out for a moment! I think that when you can identify a fear and harness those raw emotions, a story becomes much more powerful. 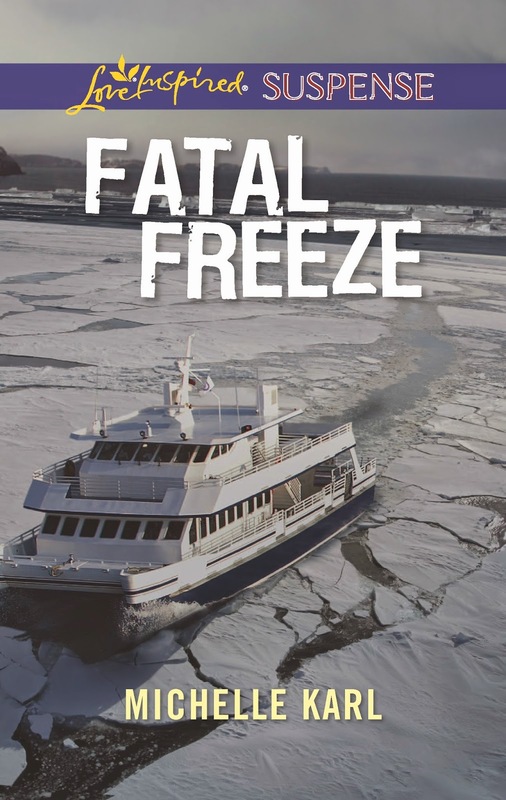 My hero and heroine in Fatal Freeze are trapped on an icebound ferry in the ocean, and just thinking about being in that situation makes me shiver and cringe in fear. Imagine if you were in their shoes, with a killer aboard. Yikes. Throw a little romance into the mix, and that pounding heart is going to get a major workout! I’d love to know what makes you shiver and shake with fear! If you were on the run from a killer or placed in danger, what would make that situation so much worse? Commenters will be entered into a giveaway to win a copy of Fatal Freeze! Michelle Karl is an unabashed bibliophile and romantic suspense author. She lives in Canada with her husband, a co-dependent cat, and an opinionated parrot. When she's not reading and consuming copious amounts of coffee, she writes the stories she'd like to find in her 'to be read' pile. She also loves animals, world music, and eating the last piece of cheesecake. Visit her at www.michellekarl.com, on Facebook (https://www.facebook.com/MichelleKarlAuthor), or Twitter (https://twitter.com/_MichelleKarl_)! Fear of dying. It's the ultimate unknown. How does it feel? What's on the other side? There's no opportunity to change anything, it's s done deal. I completely get your fear of boats on the ocean. Though I've been on them many times, I have a healthy respect for the ocean and when it's stormy, it's frightening. Oh yikes... on the ocean during a storm?! That's one of my worst nightmares. I like what you say about having a healthy respect for the ocean. That's definitely critical... only fools rush into water unprepared! what an exciting sounding book! I haven't been on a boat on the ocean, so no fevers yet :) thanks for sharing! Thanks, Erin! I know some people just adore the ocean, so I won't spoil that possibility by saying not to ever try it. Who knows! You may be right at home on the waves! Haha. Thanks for stopping in today, Tammy! My fear is of falling... it is odd... I love rollercoaters, but I really can not stand ferris wheels... lol, you should see me with ladders... after two steps I cling like a monkey and getting down... oh boy is that a sight to see. Oh, interesting... so it's not actually a fear of heights, but a fear of the sensation of falling? And I suppose when you're in a roller coaster you're probably well strapped in, and the momentum keeps you in place. Those ferris wheels usually just have one safety bar across the front and it gets windy up there! There's nothing worse than being completely alone and feeling helpless! Especially if you were on the run! Yikes. I think knowing they are relentless. That nothing will stop them. I have some common fears such as spiders and heights but what really scares me is helplessness. Having someone I care about in trouble and not being able to help is my biggest fear! Thanks for offering this giveaway. The book sounds exciting!